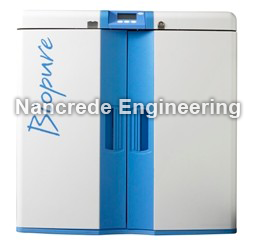 Nancrede Engineering is proud to carry ELGA’s BIOPURE line of water purification systems in Indiana, the Midwest, and nationally. Cleaning and sterilizing reusable medical equipment is becoming increasingly regulated by industry guidelines and international standards. Concern continues to grow over infection control in hospitals and the spread of hepatitis, CJD, MRSA and resistant pathogens. In addition to protecting patients and staff by preventing pathogen cross-contamination, the equipment itself must also be protected from damage by the sterilization or disinfection process. 50 years of innovation experience With this in mind we applied our expertise gained from 50 years of innovation in water purification technologies, to design our unrivalled BIOPURE range. Our reliable water purification systems employ the latest technologies to ensure a broad removal of impurities, continual bacterial destruction and endotoxin removal. A compact design with an in-built wrap-around reservoir ensures a minimal amount of precious hospital or surgery space is occupied. Our BIOPURE range is easy and cost-effective to operate and a self-disinfection program contributes towards straightforward maintenance. Peace of mind is provided by a unique E-key, which restricts access to the most critical functions. These water quality guidelines and standards serve to minimize the risk of cross infection to patients from a range of infectious pathogens. If you are searching for replacement filters, lab cartridges, and lamps, such as LC141 ELGA deionization lab cartridges, LC174 ELGA Medpure deionization cartridges, LC140 ELGA pretreatment cartridges, LC136M2 ELGA composite vent filter, or the LC105 ELGA ultraviolet lamp, visit The Nancrede Engineering Store.